Today I read an interview with Boy George in which he talks about how he is now a raw vegan. He says that he looks and feels better than he has in his entire life. While I’ll have to take his word on how he feels, I will say that he does indeed look pretty spectacular. This article stood out to me because, somewhere deep inside, I’m pretty sure I’m a closeted raw foodist. I don’t know that it’ll ever become a way of life for me, but I absolutely adore the fresh, vibrant flavors of well-prepared raw food. And I love the way it makes me feel. 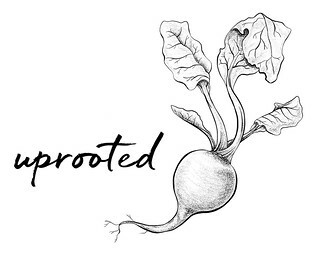 When I’m eating mostly raw I feel energized in a way that I don’t otherwise. It’s like every cell in my body lights up—my vision improves, my head clears, and I feel bouncingly, buzzingly alive. 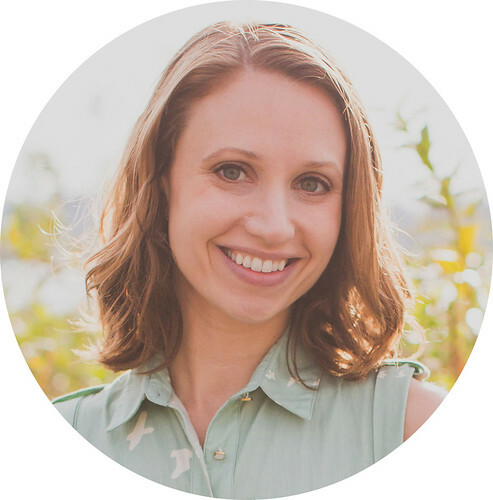 Reading that interview today made me crave a week’s worth of raw foods and long for that light, bright feeling—especially since it was dark and rainy and we were cooped up inside all day. 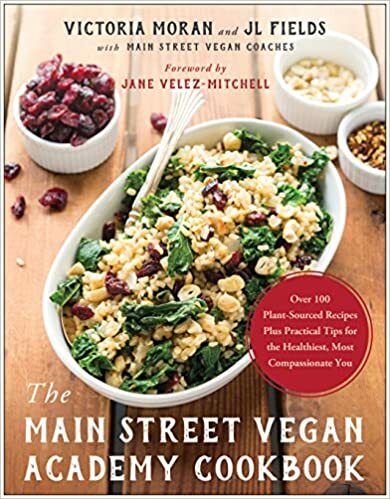 This past summer, I ate a ton of raw food; it’s so easy during the summer, when everything is ripe and fresh. I managed to dig up some iPhone snaps of a few of the things that I/we enjoyed during those warmer months. Maybe looking through these photos will help to quell the cravings? 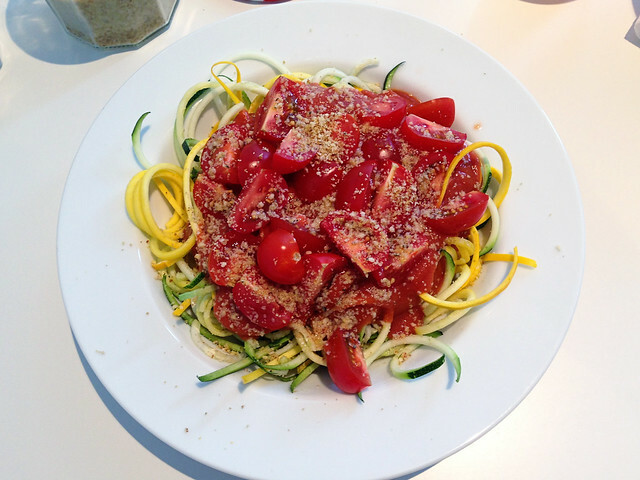 Spiralized zucchini pasta with raw tomato marinara, chopped cherry tomatoes, and almond-hempseed parm. 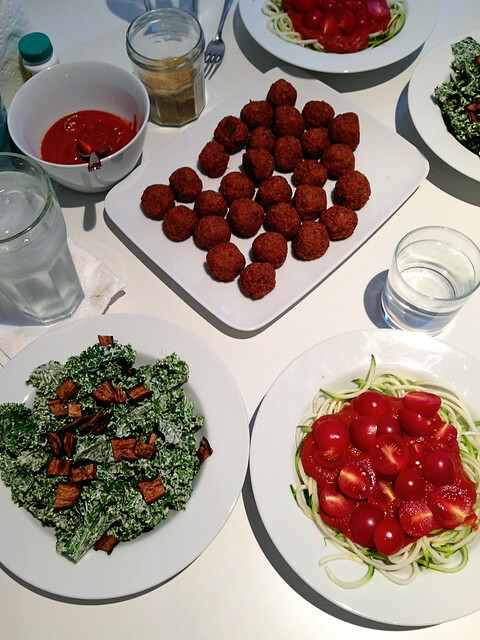 Spaghetti dinner: spiralized zucchini pasta with raw tomato marinara and chopped cherry tomatoes, raw kale caesar with eggplant bacon, and meatless balls (not raw, but delish), almond-hempseed parm on the side. 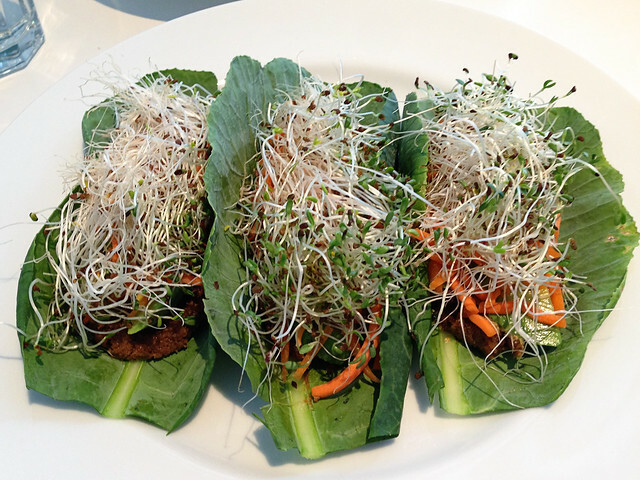 Collard leaf “tacos” with BBQ pumpkinseed pate, shredded carrots, avocado, and alflafa sprouts. 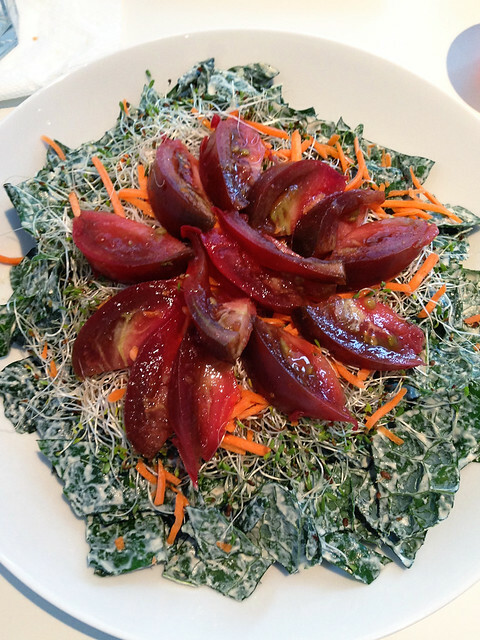 Kale caesar with alfalfa sprouts, shredded carrots, and sliced heirloom tomato. Okay, so that definitely didn’t help. Is it weird that I could totally go for a giant kale salad at 9pm? Wait, don’t answer that.